That's the review, seriously. Want to know more? Okay. If you have ever woken in the night because your mattress is lumpy, sagging, or making you overly hot, you'll understand the misery of what our lives used to be like. That was until we received a box through the post that transformed the way we sleep. We check out The Casper Mattress (and give you the chance to get £50 off with our Casper mattress discount code). Casper is a name which has been causing quite a stir in the bedroom furniture industry over the past couple of years. 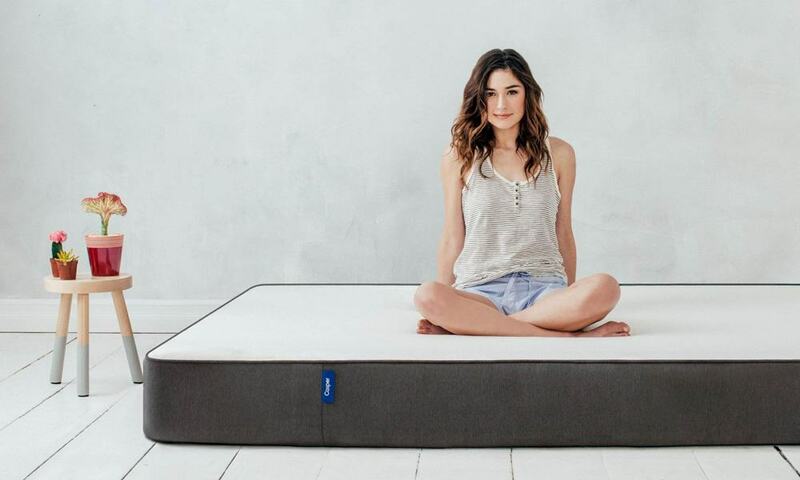 When we first heard about them, we assumed the headline was that their special memory foam mattresses come vacuum-sealed in a compact box – a pretty remarkable thing to behold in itself. However, after receiving one and sleeping on it for over a week now, we can tell you that you'll soon forget about the packaging, and everything else in your life, as you drift off to sleep on an exceptionally comfortable mattress. When offered one to review, we ordered a King Size. 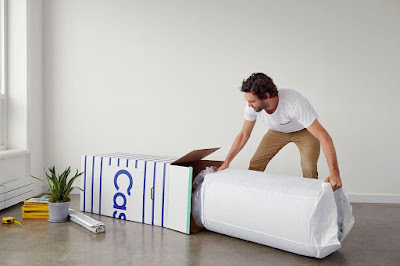 Despite the sheer size of your typical King Size mattress, the box the Casper came in was impressively compact and surprisingly light. It was more than manageable for one of us to hoist it upstairs to the bedroom, and there was no need to bend anything around the corners, or squeeze it through doorways, as with a normal mattress. Once in the bedroom it was a simple case of opening the box, pulling out the wrapped mattress (pictured below), then pulling off the plastic. The mattress itself is folded in half and then tightly rolled, but kept thin by the final vacuum-sealed layer of plastic. Once you cut into that the air starts to enter and the Casper Mattress starts to gently expand to the proper shape. You then pull it onto your bed and wait. Expansion took about 15 minutes until it appeared plump and full. Again, it was a pretty shocking transformation considering how thick it was when we took it out of the box. The edges are dressed in a denim-like fabric, while the top-side sleeping area is white with a pock-marked pattern. It looks very modern, and the two-tone design certainly makes it stand out from the crowd. When humans are colonising Mars, they'll probably sleep on something that looks like this. Then when we were sure it was ready, we got on. Sweet Jesus, this thing is comfortable. Going from an admittedly expensive sprung mattress to this is a big shift, but not one we regretted. For a start (and this might not be a big deal to many) it is silent, and as you sit, fall, or jump onto it there is none of the typical groan and creak of metal springs. Hey, as some of our number co-sleep with their kids, it is important. Secondly, the level of support is second to none. The memory foam in the core of the mattress feels firm enough to prop you up, regardless of whether you're laying, sitting, or even standing on it. You don't sink in, but you also don't feel like you're laying a slab of concrete. It is a difficult sensation to describe, but it is almost like the feeling you get from laying on a trampoline; the surface will compress and stretch as you move, but it always returns to support you. The Casper Mattress is further aided in the comfort department by a top layer of softer and squishier material. It feels like it is only an inch or so thick, but has a spongy, softer texture than the rest of the mattress. Lay your hand gently upon the surface of this, and you'll notice how it sinks slightly, almost like a cushion, and hot-damn is it comfy to lay on. It is this top layer that boasts an innovative air-flow feature, whereby air is allowed to get into it and underneath your body, keeping you cool. 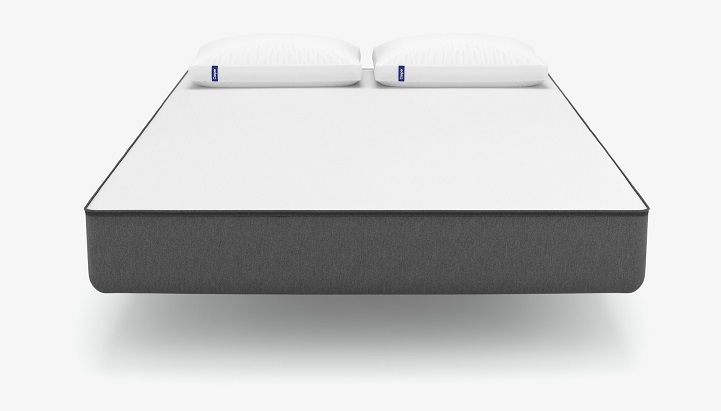 Also, apparently, memory foam by its very nature can pull heat away from your body, so a night on this, even under a full duvet, on a warmish spring night, with a sleeping buddy, never resulted in the dreaded back-sweats. We could go on, but there aren't many more creatives ways of writing about that 'Ahhwwrrhhhhh...' feeling you get when you're completely comfortable. If you thought the epitome of relaxation was sitting on a floating sun lounger in the pool of a tropical Spa resort, you're wrong. It is the Casper Mattress. You need to try it. Plus – get £50 off your order with our Casper Mattress discount code by shopping via the link above. Have a good night!